Continuous layer of rigid foam insulation keeps floors warm and comfortable. 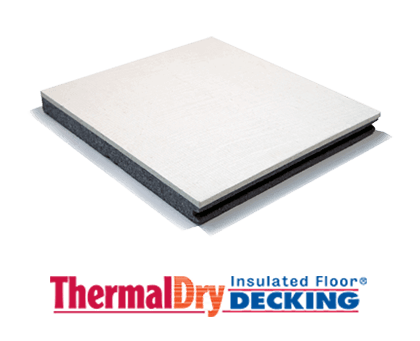 ThermalDry® insulated subfloor system will not attract mold or be damaged by moisture. 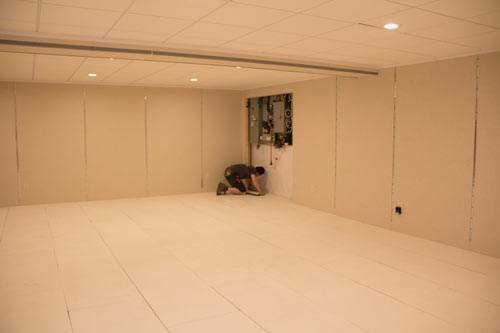 Insulation and subflooring get installed in a single step, providing fast, hassle-free installation. ThermalDry® is only available from a certified installer in your area. Contact us to request an inspection & get a free cost estimate to have it installed in your home. See why ThermalDry® Insulated Floor Decking™ is a smarter alternative to wood subflooring in your finished basement. Do you have cold, damp basement floors? 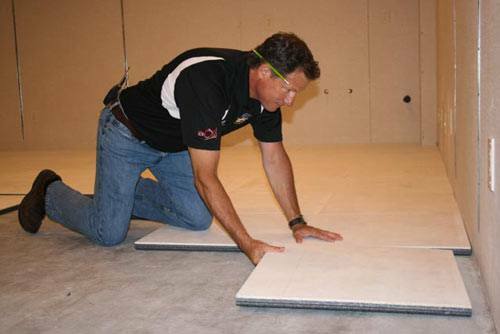 Heat loss, moisture, and mold are all common enemies when it comes to finishing your concrete basement floors. Moisture and mold will inevitably destroy organic materials, like carpet and plywood subflooring, leaving you with a smelly, nasty, uncomfortable basement. Before you install flooring in your basement, consider the benefits of ThermalDry® Insulated Floor Decking™. 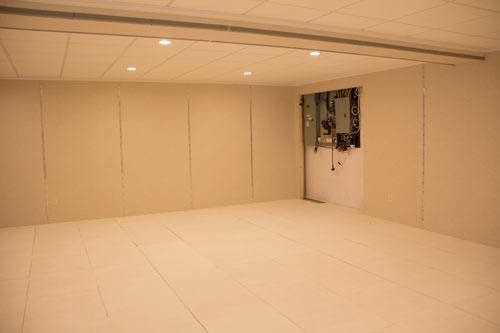 The revolutionary basement subfloor system leaves you with a comfortable, dry basement floor. 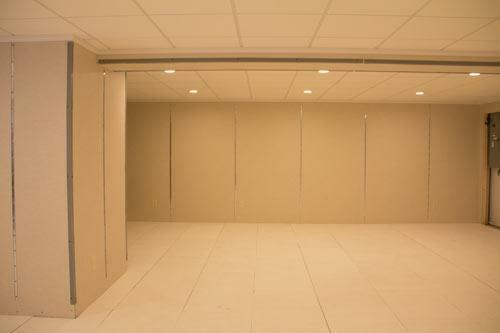 Contact us today to schedule a free consultation with your local basement finishing contractor! No replacing wet flooring. Grooves in the bottom of the insulated floor decking allow water from a plumbing leak to drain and dry without damaging finished flooring. Subfloor solution. Plumbing leaks and damp concrete floors can’t damage ThermalDry® Floor Decking. This subfloor system includes a layer of rigid foam insulation to keep the finished floor surface just as comfortable as any upstairs floor. Best in the basement. ThermalDry® Floor Decking provides a permanent subfloor that’s insulated and immune to mold and moisture damage. 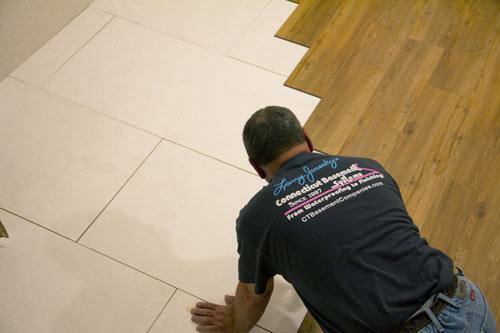 It’s the perfect preparation for your finished floor. 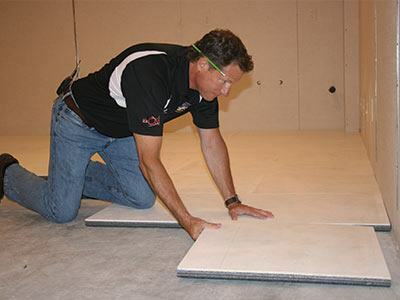 At Basement Systems, we know what DOESN’T work as basement flooring: wood subflooring and carpet padding or other porous materials placed directly on the concrete slab. 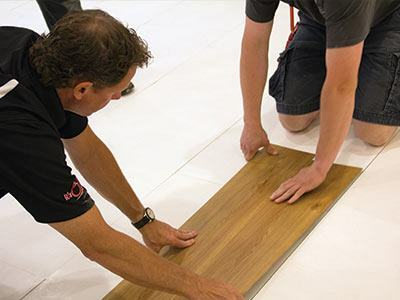 Our crews have removed many dumpster loads of ruined basement flooring, so we’re determined to only install basement flooring products that won’t absorb moisture, support mold growth or be damaged if your basement gets wet for any reason. If you believe that the best value is achieved by “doing it once and doing it right, so you don’t have to do it over,” ThermalDry® Insulated Floor Decking™ is definitely the right choice for your basement. 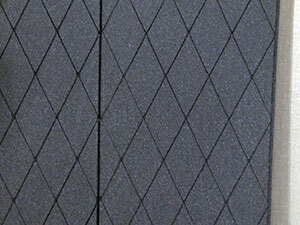 ThermalDry® Insulated Floor Decking™ is made from an inorganic Magnesium Oxide board. There is no organic material for mold to grow on, and the material provides a warm, dry surface for your finished flooring. 1" of high-performance foam insulation helps keep floors warm and free of condensation. The system's low-profile design helps save a full inch of ceiling height compared to a built-up wood subfloor. ThermalDry® Insulated Floor Decking™ panels can be installed anywhere you want to install finished flooring over a concrete slab.